Academy Award winner Matthew McConaughey is not one of those actors whose vocabulary is limited to words found in the dictionary. He is a one-man sound-effects reel with a variety of grunts, giggles, growls, squeaks, and various animal-like noises at his disposal. At certain points in films like The Wolf Of Wall Street, he’s like Police Academy’s Michael Winslow minus the impulse control. 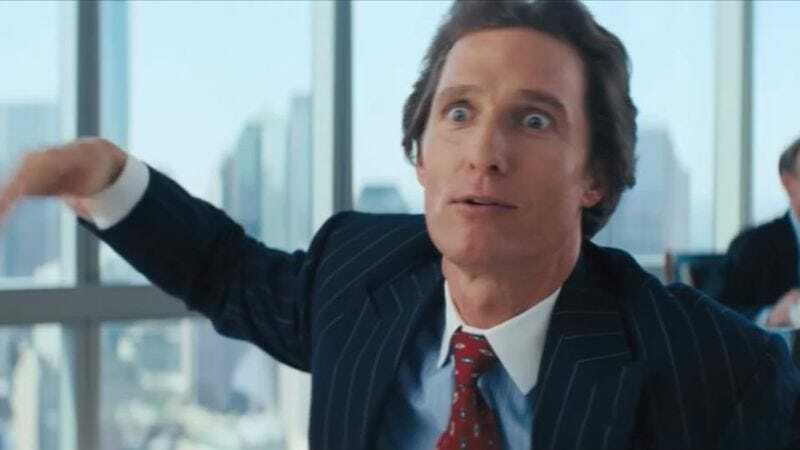 The best of the actor’s nonverbal vocalizations are compiled in a new supercut from Owenergy Studios entitled “Matthew McConaughey Makes Noises.” And does he ever. It doesn’t matter whether he’s appearing in a prestige Oscar-bait picture like Dallas Buyers Club or a low-budget horror flick like Texas Chainsaw Massacre: The Next Generation. Give him a scene, and he will improve it by howling like an angry monkey with internal injuries. The four-minute compilation takes scenes from McConaughey’s entire career, so expect to see a lot of shirtlessness here, too. The compilation, with very few changes, could have been retitled “Matthew McConaughey Hates Shirts.” Among the co-stars subjected to the odd noises in the video is Bill Murray, who rode with a particularly demented McConaughey in Larger Than Life back in 1996 and thus got to hear his first-rate elephant impression from just a few feet away. The most suspenseful material here, however, comes from the little-loved 2009 comedy Ghosts Of Girlfriends Past, in which the actor undergoes an epic struggle with a wedding cake. That scene required him to make so many noises. He was ready, though.